Constanța ([konˈstant͡sa]), historically known as Tomis (Greek: Κωνστάντζα or Κωνστάντια, Konstantia, Bulgarian: Кюстенджа or Констанца, Turkish: Köstence), is the oldest continuously inhabited city in Romania. It was founded around 600 BC. The city is located in the Dobruja region of Romania, on the Black Sea coast. It is the capital of Constanța County and the largest city in the region. As of the 2011 census, Constanța has a population of 283,872, making it the fifth most populous city in Romania. The Constanța metropolitan area includes 14 localities within 30 km (19 mi) of the city, and, with 425,916 inhabitants, it is the second largest metropolitan area in Romania. The Port of Constanța has an area of 39.26 km2 (15.16 sq mi) and a length of about 30 km (19 mi). It is the largest port on the Black Sea, and one of the largest ports in Europe. "After achieving this victory (against Cyrus the Great) and winning so much booty from her enemies, Queen Tomyris crossed over into that part of Moesia which is now called Lesser Scythia - a name borrowed from Great Scythia -, and built on the Moesian shore of the Black Sea the city of Tomi, named after herself." In 29 BC the Romans captured the region from the Odryses, and annexed it as far as the Danube, under the name of Limes Scythicus ("Scythian Frontier"). In AD 8, the Roman poet Ovid (43 BC-17) was banished here by Augustus and it was where he spent the remaining eight years of his life. He laments his exile in Tomis in his poems: Tristia and Epistulae ex Ponto. Tomis was "by his account a town located in a war-stricken cultural wasteland on the remotest margins of the empire". A statue of Ovid stands in the Ovid Square (Piața Ovidiu) of Constanța, in front of the History Museum (the former City Hall). A number of inscriptions found in the city and its vicinity show that Constanța lies where Tomis once stood. Some of these are now preserved in the British Museum in London. The city was afterwards included in the Province of Moesia, and, from the time of Diocletian, in Scythia Minor, of which it was the metropolis. After the 5th century, Tomis fell under the rule of the Eastern Roman Empire. During Maurice's Balkan campaigns, Tomis was besieged by the Avars in the winter of 597/598. Tomis was later renamed to Constantiana in honour of Constantia, the half-sister of Roman Emperor Constantine the Great (274-337). The earliest known usage of this name was "Κωνστάντια" ("Constantia") in 950. The city lay at the seaward end of the Great Wall of Trajan, and has evidently been surrounded by fortifications of its own. After successively becoming part of the Bulgarian Empire for over 500 years, and later of the independent principality of Dobrotitsa/Dobrotici and of Wallachia under Mircea I of Wallachia, Constanța fell under the Ottoman rule around 1419. A railroad linking Constanța to Cernavodă was opened in 1860. In spite of damage done by railway contractors there are considerable remains of ancient masonry walls, pillars, etc. An impressive public building, thought to have originally been a port building, has been excavated, and contains the substantial remains of one of the longest mosaic pavements in the world. In 1878, after the Romanian War of Independence, Constanța and the rest of Northern Dobruja were ceded by the Ottoman Empire to Romania. The city became Romania's main seaport and transit point for much of Romania's exports. On October 22, 1916 (during World War I), the Central Powers (German, Turkish and Bulgarian troops) occupied Constanța. According to the Treaty of Bucharest in May 1918, article 10.b (a treaty never ratified by Romania), Constanța remained under the joint control of the Central Powers. Allied troops liberated the city in 1918 after the successful offensive on the Thessaloniki front knocked Bulgaria out of the war. In the interwar years, the city became Romania's main commercial hub, so that by the 1930s over half of the national exports were going through the port. During World War II, when Romania joined the Axis powers, Constanța was one of the country's main targets for the Allied bombers. While the town was left relatively undamaged, the port suffered extensive damage, recovering only in the early 1950s. Constanța is the administrative center of the county with the same name and the largest city in the EU Southeastern development region of Romania. 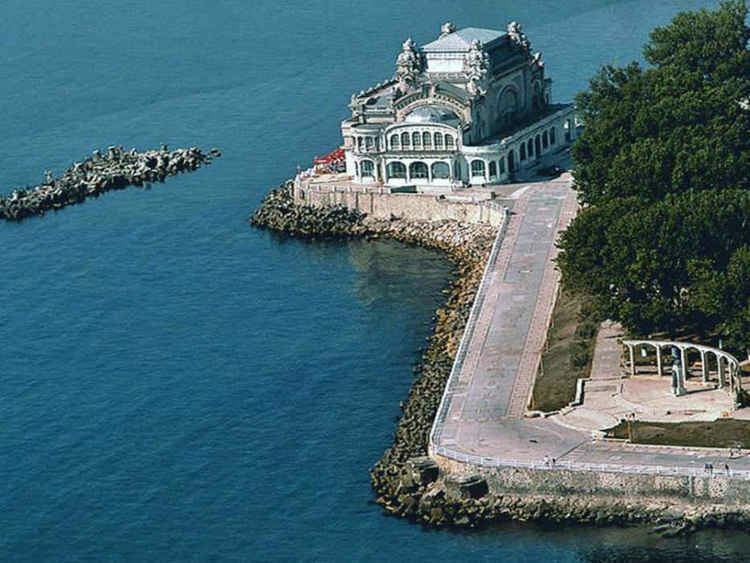 The city is located on the Black Sea coast, having a beach length of 13 kilometres (8 miles). Mamaia, an administrative district of Constanța, is the largest and most modern resort on the Romanian coast. Mineral springs in the surrounding area and sea bathing attract many visitors in the summer. Constanța is the warmest city in Romania. It has a humid subtropical climate (Cfa), with oceanic and semi-arid influences. There are four distinct seasons during the year. Summer (early June to mid September) is warm, dry and sunny with a July and August average of 23 °C (73 °F). The beginning of summer brings plenty of precipitation, but by early July the weather becomes settled and dry. Most summer days see a gentle breeze refreshing the daytime temperatures. Nights are warm and somewhat muggy because of the heat stored by the sea. Autumn starts in mid or late September with warm and sunny days. September can be warmer than June, owing to the heat accumulated by the Black Sea. The first frost occurs on average in mid November. Winter is much balmier compared to other cities in southern Romania. Snow is not abundant but the weather can be very windy and unpleasant. Winter arrives much later than in the interior and December weather is often mild with high temperatures reaching 8 °C (46 °F) - 12 °C (54 °F). The average January temperature is 1 °C (34 °F). Winter storms, which happen when the sea becomes particularly treacherous, are a common occurrence between December and March. Spring arrives early but it's quite cool. Often in April and May the Black Sea coast is one of the coolest places in Romania found at an altitude lower than 500 m (1,640.42 ft). Four of the warmest 7 years since 1889 occurred after the year 2000 (2000, 2001, 2007 and 2008). The winter and the summer of 2007 were respectively the warmest and the second warmest in recorded history with monthly averages for January (+6.5 °C) and June (+23.0 °C) breaking all-time records. Overall 2007 was the warmest year since 1889 when weather recording began. According to the 2002 Romanian census, there were 310,471 people living within the city of Constanța, making it the fifth most populous city in Romania. As of 2011, 283,872 inhabitants live within the city limits, a decrease from the figure recorded at the 2002 census. As of 2014, an article of INS said that the population of Constanța grew, the city having at the end of the year 319,678 inhabitants living permanently within the city limits. After Bucharest, the capital city, Romania has a number of major cities that are roughly equal in size: Constanța, Iași, Cluj-Napoca and Timișoara. The metropolitan area of Constanța has a permanent population of 387,593 inhabitants, i.e. 61% of the total population of the county, and a minimum average of 120,000 per day, tourists or seasonal workers, transient people during the high tourist season. As of 1878, Constanța was defined as a "poor Turkish fishing village." As of 1920, it was called "flourishing," and was known for exporting oil and cereals. Constanța is one of Romania's main industrial, commercial and tourist centers. During the first half of 2008, some 3,144 new companies were established in Constanța and its neighbouring localities, a number surpassed only in Bucharest and Cluj County. The Port of Constanța is the largest on the Black Sea and the fourth largest in Europe. The city also boasts a comparably large shipyard. Tourism has been an increasingly important economic activity in recent years. Although Constanța has been promoted as a seaside resort since the time of Carol I, the development of naval industry had a detrimental effect on the city's beaches. Nevertheless, due to its proximity to other major tourist destinations, Constanța receives a significant number of visitors every year, who discover and visit the city's monuments and attractions. Also, Constanța is a centre of commerce and education, both of which significantly contribute to the local economy. The opening, in 1895, of the railway to Bucharest, which crosses the Danube River at the bridge at Cernavodă, brought Constanța considerable transit trade in grain and petroleum, which are largely exported; coal and coke head the list of imports, followed by machinery, iron goods, and cotton and woollen fabrics. The A2 motorway provides a rapid road link between Constanța and Bucharest, while the A4 motorway acts as the city's outer traffic ring, diverting heavy traffic to and from the Port of Constanța and to Mangalia. The Port of Constanța includes the North Port and the South Port, and is the fourth largest in Europe. It is protected by breakwaters, with a lighthouse at the entrance. The port is sheltered from the northerly winds, but southerly winds can prove highly dangerous at times. The Black Sea squadron of the Romanian fleet is stationed here. A large canal (the Danube-Black Sea Canal) connects the Danube River to the Black Sea at Constanța. The city is served by Mihail Kogălniceanu International Airport. Constanța's public transport system is run by Regia Autonomă de Transport în Comun Constanța (RATC), and consists of 23 year-round bus lines, and one summer sightseeing double decker open top bus line to tourists. In the early 2000s, the city bought 130 new MAZ buses to replace the aging fleet of DAC buses. The entire fleet is now made up of buses from the 2000-2008 period, which are painted in distinctive bright colors, such as pink, yellow and green. There is also a fleet of double decker Volvo buses that run in the summer, providing access to and from the resort of Mamaia. As of October 2013, the cost of a return ticket is 3 RON. Trams were active until the early 2000s. By this time, however, the cars were almost 25 years old and with the difficulties in maintenance, were decommissioned in favour of long-wheelbase buses. Two trolley bus lines were active until the late 2000s - now also decommissioned and replaced by buses. At the end of March 2014, all public buses were upgraded with Wifi for free use by all passengers. Speeds fall into the 3G HSDPA mobile range. Also, as an upgrade to the ticketing system, since the same time, tickets and per day all bus lines subscriptions can be bought via SMS, accepted by all national operators. There are also plenty of private minibuses (similar to a share taxi) which run along longer and more intricate lines. The price of a minibus ticket, as of October 2013, varies between 1 and 2 RON depending on the operator. Situated at the crossroads of several commercial routes, Constanța lies on the western coast of the Black Sea, 185 miles (298 km) from the Bosphorus Strait. An ancient metropolis and Romania's largest sea port, Constanța traces its history some 2,500 years. Originally called Tomis, legend has it that Jason landed here with the Argonauts after finding the Golden Fleece. One of the largest cities in Romania, Constanța is now an important cultural and economic center, worth exploring for its archaeological treasures and the atmosphere of the old town center. Its historical monuments, ancient ruins, grand Casino, museums and shops, and proximity to beach resorts make it the focal point of Black Sea coast tourism. Open-air restaurants, nightclubs and cabarets offer a wide variety of entertainment. Regional attractions include traditional villages, vineyards, ancient monuments and the Danube Delta, the best preserved delta in Europe. The National History and Archaeology Museum is located in the old City Hall and has a very large collection of ancient art. Designed by the sculptor Ettore Ferrari in 1887, the statue dedicated to the Roman poet, Publius Ovidius Naso, gives name to this square. Emperor Augustus exiled Ovid to Tomis in 8 AD. A vast complex on three levels once linked the upper town to the harbor. Today, only about a third of the original edifice remains, including more than 9,150 sq ft (850 m2) of colorful mosaics. Built toward the end of the 4th century AD and developed over the centuries, it was the city's commercial center until the 7th century. Archaeological vestiges point to the existence of workshops, warehouses and shops in the area. Remains of the Roman public baths can still be seen nearby. Aqueducts brought water 6 miles (10 km) to the town. Soaring 26 feet (7.9 m), the Genoese Lighthouse was built in 1860 by the Danubius and Black Sea Company to honor Genoese merchants who established a flourishing sea trade community here in the 13th century. Designed by architects Daniel Renard and Petre Antonescu and completed between the two World Wars, the art-nouveau style Constanța Casino features sumptuous architecture and a wonderful view of the sea. The pedestrian area around the Casino is a sought-after destination for couples and families, especially at sunset. Blending pre-Romantic and Genovese architectural styles, this late 19th century building features four columns adorned with imposing sculptured lions. During the 1930s, its elegant salons hosted the Constanța Masonic Lodge. The park houses columns and fragments of 3rd and 4th-century buildings and a 6th-century tower. Constructed in Greco-Roman style between 1883 and 1885, the church was severely damaged during World War II and was restored in 1951. The interior murals display a neo-Byzantine style combined with Romanian elements best observed in the iconostasis and pews, chandeliers and candlesticks (bronze and brass alloy), all designed by Ion Mincu and completed in Paris. Built in 1910 by King Carol I, the mosque is the seat of the Mufti, the spiritual leader of the 55,000 Muslims (Turks and Tatars by origin) who live along the coast of the Dobrogea region. The building combines Byzantine and Romanian architectural elements, making it one of the most distinctive mosques in the area. The centerpiece of the interior is a large Turkish carpet, a gift from Sultan Abdul Hamid. Woven at the Hereke Handicraft Center in Turkey, it is one of the largest carpets in Europe, weighing 1,080 pounds. The main attraction of the mosque is the 164 ft (50 m) minaret (tower) which offers a stunning view of the old downtown and harbor. Five times a day, the muezzin climbs 140 steps to the top of the minaret to call the faithful to prayer. The mosque was built between 1867-1868 by Ottoman Sultan Abdülaziz for Turks who were forced to leave Crimea after the Crimean War (1853–56) and settled in Constanța. The mosque has a 24m high minaret and was subject to a restoration in 1945 and 1992. Built in 1927 by Demostene Tranulis, a local philanthropist of Greek origin, this theatre used to be called “Tranulis” before 1947, after the name of its benefactor. It's a fine building featuring elements of neoclassical architecture, located in the heart of the city, on Ferdinand Boulevard. The museum is the largest institution of this kind in Romania and it hosts precious evidence concerning the development of the country's military and civil navy. The idea of founding the museum was outlined for the first time in 1919, but it was materialized only in the late 1960s at the initiative of Nicolae Ceaușescu, when the Romanian Navy Museum was officially opened on 3 August 1969. Museum collections capture models of ships, knots, anchors, navy uniforms. It has also a special collection dedicated to important figures who made history in the Romanian navy. Prices for one ticket go from 5 RON to 10 RON. The current mayor of Constanța is Decebal Făgădău (Social Democratic Party). Constanța is home to several football clubs, with FC Viitorul playing in the Romanian first division. There are two rugby teams in Constanța: RC Farul Constanța, who play in Divizia Națională BRD, and Constructul Cleopatra Constanța, who play in Divizia A. One of the top Romanian handball clubs, HCM Constanța, is also based in the city. Olympic champion gymnasts Simona Amânar and Cătălina Ponor were born in Constanța. Răzvan Florea, Olympic champion swimmer was also born in Constanța. The tennis player Simona Halep is also a native of the city. Constanța and Mamaia, the neighboring summer holiday resort, are home to the Constanța-Mamaia ETU Triathlon European Cup that was held there in 2014 and 2015 and is also planned to take place in 2016. National College of Arts "Queen Marie"
Livia Buzoianu and Maria Barbulescu, "Tomis," in Dimitrios V. Grammenos and Elias K. Petropoulos (eds), Ancient Greek Colonies in the Black Sea, Vol. 1 (Oxford, Archaeopress, 2001) (BAR International Series; 1675 (1-2)), 287-336.